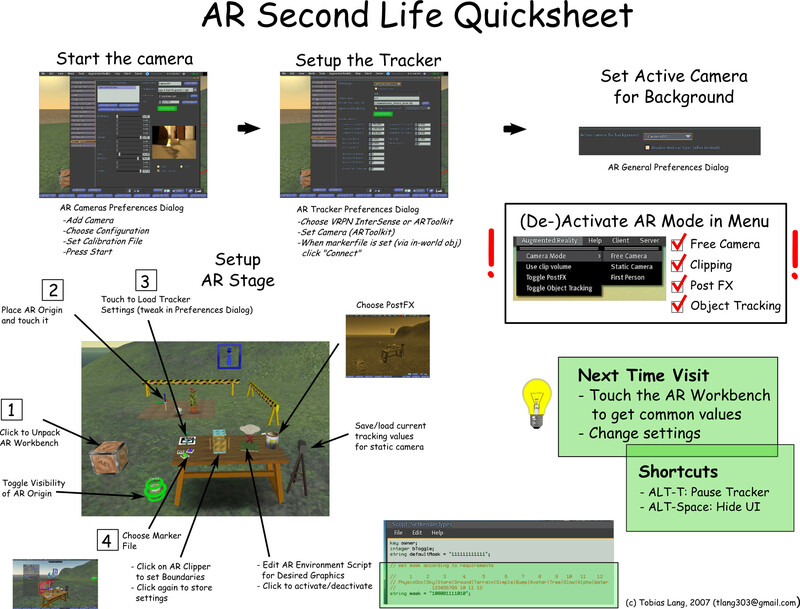 Our AR enabled Second Life client is compatible to the main Second Life infrastructure and can be installed using the original installer. One premise of Augmented Reality is the knowledge of the exact location and orientation of the real camera. With this information, the virutal camera can be correctly aligned to superimpose the virtual graphics. So far, two different Trackers are supported – InterSense and ARToolkitPlus. Both trackers are supported via the VRPN interface. To get these trackers working, they have to be setup in the preferences panel of Second Life. The InterSense tracker requires less settings, since most of the it’s setup is done in a dedicated software from the manufacturer. Every fiducial has a unique pattern which identifies its number. Before the use, several fiducials should be downloaded and printed out. The print size depends on the applications. 10 cm are reasonable for close ups, the further away the camera, the bigger a fiducial should be. A special XML file specifies which markers, with what size, will be used by the application. Each tracker input is bound to a so called Sensor. The virtual camera is bound to a sensor, so can be other in-world objects. A special in-world tool, looking like several fiduials, contains notecards with common setups. On each visit of the AR Stage the values can be re-loaded by clicking on the object. The notecards also contain comments, it recommended to read them. The settings for coordinate transformations, Scaling and others, can be set in the preference dialog, but should then be saved in a the AR Tracker in-world tool for future retrieval. The ARToolkit also relies on a camera calibration file, which is specified in the AR Cameras tab of the preferences dialog. First the origin in Second Life has to be set. Touch the AROrigin object, or touch the workbench. Then activate tracking in the Augmented Reality menu. I have a hard time understanding what to install. The client I can not find anywhere. The VRPN interface does not have an installer. ARToolkitPlus also doesn’t have an installer. I realy would like to experiment, but can you help me out with a more easy to understand step by step way to get it working. Sorry if the page is a bit misleading; it’s partly up here for the students here at Tech to refer to. The client is not (yet) available to anyone outside my lab. If we had funding to pay a student to support the client, I’d like to give it away; but since we don’t, I can’t. so… there´s no way to get it yet? Nope, not right now. I’m still hoping to get funding for the coming year so we’ll see then! This would be the ultimate tool for machinima! @jake Doing AR Machinima was actually the original motivation behind the project. But, it was too hard to keep working, so we let it go for now. A shame. This is an amaizing project and the results look fantastic. You and your team have done a great job putting this together. As ARTOOLKIT and SECOND LIFE VIEWER are GPL opensource have you considered releasing the code under one or both of these projects. I am sure if you were to do this it would be picked up by one of the many SL client developers (meerkat, greenlife, hippo, emerald or even SL Snowglobe etc) and would provide an incredible amount of value to Second Life, Opensim and other MMO environments. Thanks Nink, I agree it would be good to open source it; we just haven’t had the time to make the (horrifically complex) source tree available. I’ll look into it again. Thats great Blair, Thank you for considering this. AR is a hot item at the moment and is starting to peak on the Gartner hype curve. Secondlife and Opensim are quickly becoming the defacto standards for education and government. This would be a wonderful give back to the community. Low cost HMD`s such as vuzix are already integrated into SL client and with the low cost of laptops a complete mobile AR configuration HMD, Camera, Laptop etc with your opensource software would be possible for under $1000. This would make an ideal solution for students and researchers. Thank you for considering this Blair and I look forward to watching your continued success in augmented reality and virtual worlds. Great job! Totally amazing; the mind boggles at how this could be taken further. I’m with nink on this; I believe that open sourcing this groundbreaking piece of software will probably boost OpenSim/AR work immensely by making it available also to non-AR-specialists. I was wondering when exactly this system will be released (with no warranty or whatever) as my department was looking for something like this to use this as an experimental system within SL. If you could email me the details on if/when this will be released and on what platforms, I would really appreciate it! Perhaps if necessary, some of the department professors could contact you with more information about the usage. The work/research on this is fantastic… I’d love to see something like this running on the OpenSimulators. Has there been any movement/plans on releasing the source code to this project?? I don’t think we will be releasing the source; the folks who did it are long graduated, and it was very very complicated. Tidying up the source for release would be too much work, ironically!